Cyathea dealbata with its signature silver undercoat. Self-sown plants at the half-sunny entry of a shady pathway in a very dry Auckland garden have yet to develop any trunk at all after 16 years. Photo by George Schenk. wild. At a slender 8 inches (20 cm) in diameter, the trunk supports bipinnate-pinnatifid to tripinnate masses of fronds 10 to 18 ft. (3 to 5.4 m) long on a black skeleton with black scales. Sori are in pairs and surrounded by an indusium. 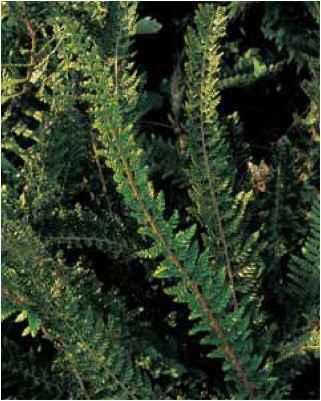 range and habitat: This native of South Sea Islands including Fiji, Tahiti, and New Zealand grows in dark gullies at elevations up to 1500 ft. (450 m). 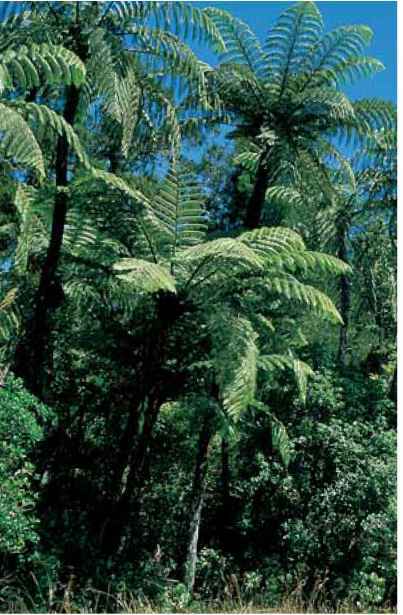 A mature grove of Cyathea medullaris in the Waitakeri Range of North Island, New Zealand. The specimens in the picture have attained a height of about 35 ft. (10.5 m) trunk and crown at an age by which human beings usually retire. Photo by George Schenk. until steamed. When dried, however, it is reputed to be a sweet. 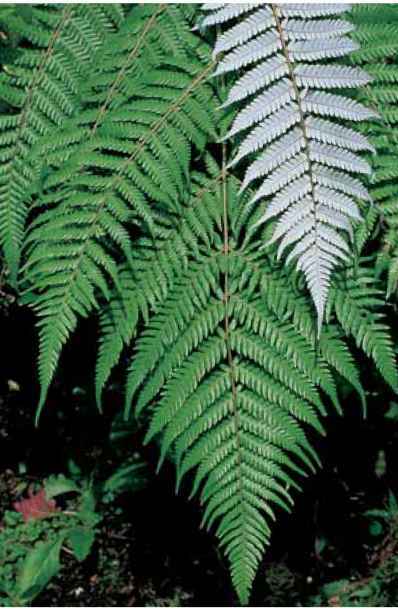 "With adequate moisture, black mamaku, as it is known in New Zealand, can become as quickly tall as Cyathea contami-nans, yet it is long-lived" (Schenk, pers. comm. ).